This is a Punjabi cultural music concert. Mainly focused on bringing the families to get together and enjoy some of the traditional folk music. As we got some of the best folk singers performing here to remind people of their rich heritage of music and an act of relaxing moments in their busy life. 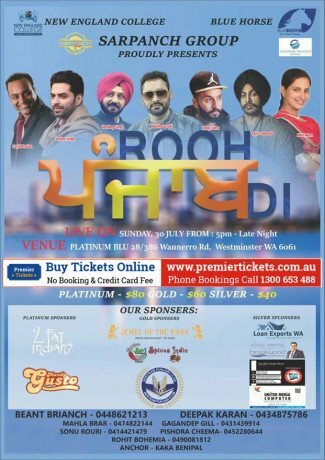 Premier Tickets Australia is proud to be the online ticketing partner for Rooh Punjab Di Live in Perth on July 30th 2017 @ PLATINUM BLU. Contact us for any of your ticketing & marketing needs. Premier Tickets is an online event marketing and ticketing agency. Premier Tickets will NOT be responsible for any changes related to the event schedule, artist, venue or cancellation and refunds related to the tickets for this event .